Geckos are usually small to medium sized lizards that are native to the warmer parts of the world. There are over 1,600 different species of geckos but not all of them are commonly kept as pets. The geckos that are most often kept as pets are usually under a foot long and have lifespans between 10 and 20 years. Because of their small size and long lifespan, geckos have become very popular pets but their care can still vary some between species. There are of course many other types of geckos both in the wild and as pets but these other species are not as commonly seen as the aforementioned five. If you want a pet gecko, it's best to acquire a captive-bred one from a reputable breeder. If you take in a wild-caught gecko you won't know what diseases or ailments it may be carrying. Look for a gecko that has clear eyes, skin without dry patches, all its fingers, toes, and its tail, as well as a healthy appetite. Even though there are many kinds of geckos, some of them have similar temperaments and exhibit similar behaviors. For the most part, geckos are pleasant, docile pets but most of them prefer not to be handled by humans too frequently as it can be stressful for them. Activity: Most geckos, including the popular leopard geckos, crested geckos, tokay geckos, and African fat-tailed geckos, are nocturnal so they will be most active at night but there are some species of geckos that are active during the day, including the aptly named day gecko. Vocalizations: They're not terribly vocal but some geckos make noises such as chirping, barking, and clicking when they are defending their territory or attracting a mate. Most of the time geckos are completely silent. Temperament: Geckos are not usually aggressive reptiles unless two males are housed together. Because of this, it's best to separate male geckos since they may attack each other with little warning. It's rare for a gecko to bite a person but there are some species that are more likely to do so, such as the tokay gecko. Care requirements will vary some from species to species but for the most part, geckos need to be kept in enclosures that have branches available for climbing, a water bowl, a hiding place, and secure lids. Geckos can escape through small holes so an aquarium with a tight fitting lid is recommended for housing geckos. Most geckos only require a 10 or 20 gallon aquarium since they are small reptiles but larger species will need more space. To line your gecko's cage, use a substrate such as coconut husk or orchid bark, both of which retain moisture and will not be harmful to your gecko if ingested in small amounts. Paper towels and newspaper can also be used but some concerns with the bleaching and dying of these paper products lead reptile owners to more natural options. The ideal temperature range for most geckos is between 70 and 90 degrees but some require higher basking temperature areas into the 100's. These high temperatures are achieved through the use of heat lights and heating pads. A proper temperature gradient should be provided in the appropriate temperature range for the specific species of gecko you are caring for. This typically means one side of the enclosure will be in the 70's while the other side will be in the 90's or 100's. For nocturnal species, no UVB-emitting bulbs are typically necessary but gecko species that are active during the day will need this special light. UVB rays are invisible but very important to the growth, appetite, and activity of many reptiles. Many different kinds of bulbs exist for UVB, heat, and light and some may be more appropriate for your specific kind of gecko than others. But regardless of what bulbs you choose, a proper day and night cycle should be followed to illuminate the enclosure. White light, even if it isn't providing heat or UVB rays, needs to be visible during the day or your gecko may become stressed and confused. Humidity in a gecko's enclosure should be kept between 70 and 80 percent. Misting the enclosure with water is the most common method of achieving this percentage but providing a large water bowl will also help. A hygrometer can be used to measure how humid a gecko enclosure is. Crickets and mealworms are usually the staple diets of geckos with the superworms and waxworms being more of a treat. Some gecko species do eat fruit and they are often given a formulated diet to meet their specific nutritional needs. Feeding regimens will vary based on the age and species of the gecko and may be daily or weekly. Prior to feeding a gecko, the insects must be fed a nutritious diet. This will gut-load the insects so that they can provide better nutrition to the gecko. Calcium powder should also be dusted onto the insects intermittently to supplement the gecko with this mineral. Never grab a gecko by the tail as they will often drop their tails (a natural defense against predators). However, if this should happen there is no need to panic. It will grow back although it may have a different shape and/or color. The gecko should be well fed and ideally separated from any cage mates until the tail has regrown. Stomatitis - Also called mouth rot, stomatitis is as gross as it sounds and needs to be treated as early as possible. You'll notice a reddish discoloration around the gecko's mouth and possibly some pus which looks like cottage cheese. Respiratory issues - A gecko that is wheezing or drooling may have a respiratory infection. These are usually caused from a draft or low temperatures in the enclosure. 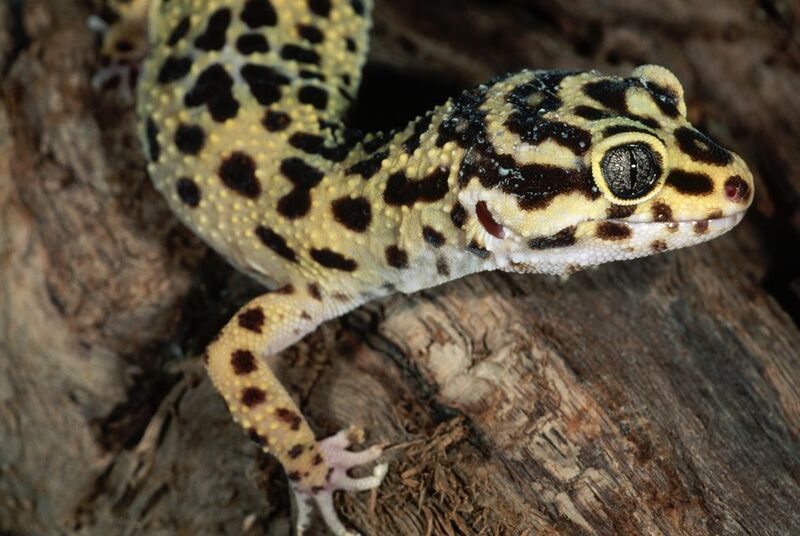 Parasites - Both internal and external, geckos also are frequently afflicted with parasitic infections. Worms and microscopic eggs may be in the feces and small mites may be on the surface of the skin. Parasitic infections on the skin will look like a red rash or you may notice your gecko has difficulty shedding while internal parasites can cause sluggishness, changes in appetite, and unusual droppings. Dysecdysis - This fancy word for problems shedding is a big problem for geckos who do not have proper humidity in their enclosures.